There are too many details for me to share. I know the point of this whole monthly project was to document the process in its entirety but you will have to bear with me as I try to find a good work life hobby hobby hobby family balance. I digress – I wanted to take a couple of minutes and probably 2 or 3 posts to fill in the blanks since my last post. No I didn’t give up. I’m not really like that when it comes to things I think I should be good at. I set out to take a picture with vivid colors involving fractals and I think the creative process is in full swing. I realized after the last round that I needed a few things – and I probably should have spent more time trying to come up with a storyboard and exactly what I wanted to do with this picture, but over the past 2 days I thought about it and decided I would make a second attempt with more paint and with more mirrors. I wanted to get reflections of reflections like in a Kaleidoscope and allow the fractal to be created in 2 dimensions. I bought some crayola washable paints and 5 mirrors from the dollar store…and new batteries for my flash. Always always always have spare batteries for your flash. Anyway. I played around with mirrors on top of mirrors and tealights and even had a pretty good setup with 5 mirrors and 10 tealights making this super cool pattern (what happened to the paint you ask – I was playing ok, just to see what I could do) and it seemed to work out with fractals in 3 dimensions, maybe not quite as much depth as I had originally hoped, but fractals none the less. Long story short a mirror fell down and spilled candles hot wax and flames all over my backdrop. Yes I am determined to burn down my house. 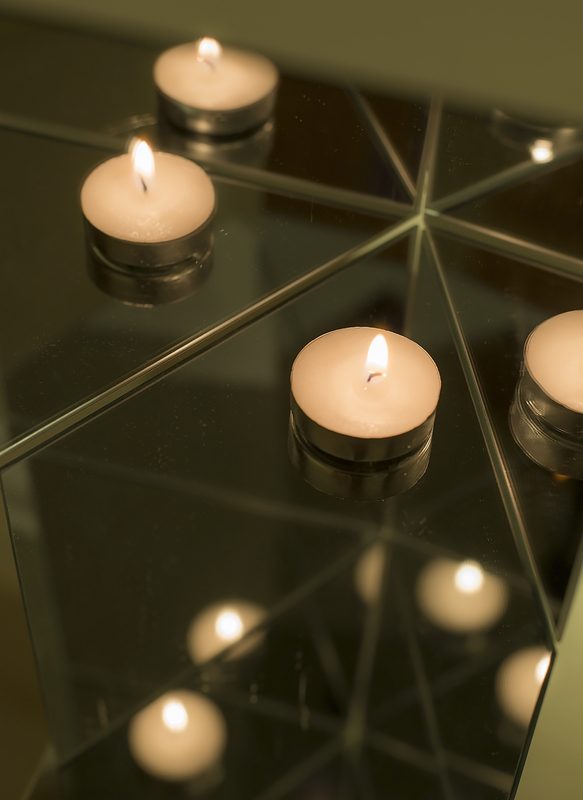 That aside I was really excited a decided to keep going rearranging a reconfiguring the mirrors and a single tea light. The result is posted above. I like it. There were still a few things I knew I needed to fix for the fractal picture. So ultimately I moved mirrors angles and repositioned back drops and speedlights to get the real high key effect I was going for. Here is what the setup looked like. Notice that I had to surround every angle in white sheets to allows for maximum light to reflect and wash out ever part of the image. I even had to cover my camera to prevent it from being a bold black blob in the picture. The reverse angle might tell the story a bit better. You can see I am using a fairly simple 2 flash setup. The flash behind the mirrors is actually a bounce flash off of my thankfully white ceiling. The speedlight is diffused as wide as it will go with a white reflector to give as much of a soft wrapping light as possible to blow out as much of the white highlights as possible. In my post processing post (coming up in about 5 minutes). 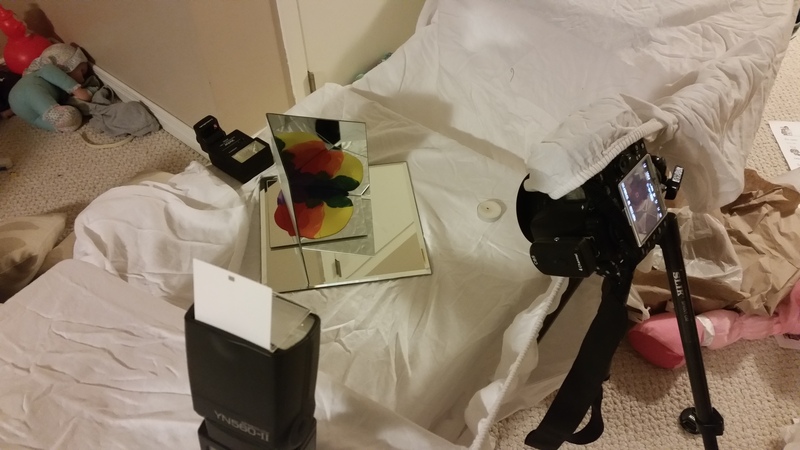 You will see the difference the shallow angle can make in a setup with a mirror like this. 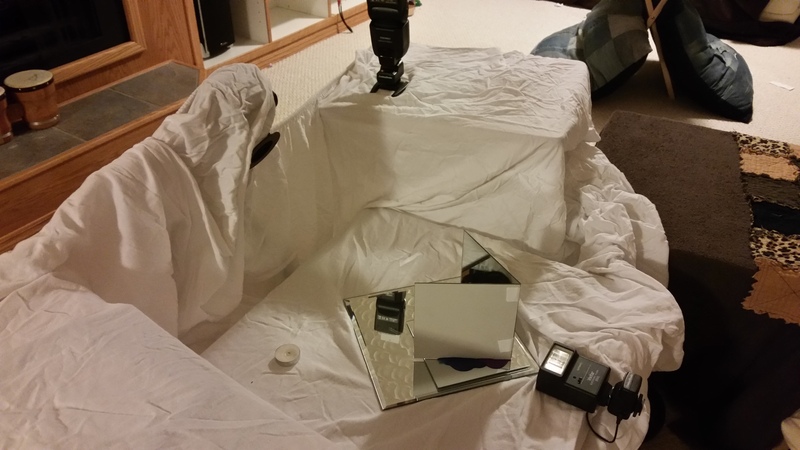 This entry was posted in 2014 Photo Project, Photos, Planning, setup and tagged 2014, 2014 photo project, cnadles, fractals, mirror, mirrors, photo, photography, photos, setup, speedlight. Bookmark the permalink.